Let's face it, modern smartphones, with their giant glass screens, are in constant danger! Those glorious screens can be easily scuffed. To protect them, people often put on screen protectors—and in China, applying screen protection might actually be a profitable livelihood. Currently trending on China's Twitter-like microblog Weibo is the story of a young man in Wuhan Hebei province who's made a living selling screen protectors! 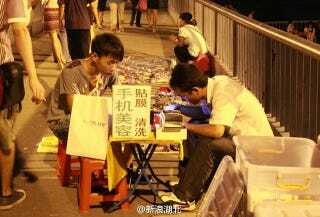 33 year-old Zhao Zhouqiao has been selling smartphone and tablet screen protectors on the streets of Wuhan for the last five years. In an interview with the Wuhan Morning Daily (via Sina), Zhao says he's been able to make a decent living. In the five years that Zhao's been selling screen protection, he's been able to purchase two apartments. According to the article, his supposed monthly income is about $2,400 a month! That's a pretty good take for a street vendor in China. Zhao says when he first started, he borrowed $240 from family to start his business. He says he sells screen protectors ranging in cost from $1.60 to about $12.80 each, though Zhao says he sells more of the $1.60 version than the pricier ones. Every screen protector takes about 30 seconds to apply. He says he makes about $0.80 per screen protector sold! How many protectors does one have to sell to be able to make over two grand a month? Zhao doesn't say, but he does admit that he's been making less money now than he did about three years ago when the iPhone 4 first came out. If possible, Zhao says he'll work every day of the month right outside the technology shopping district of Wuhan. People like Zhao are literally all over China. It's actually quite interesting to learn that through hard work and a location, they can make a decent living. Just outside of my office building in Beijing, there's a young man with a small table, a USB table lamp, and a small stool selling "professional" screen protection. Shame he only carries protectors for phones and tablets and not PlayStation Vitas.